gospel to the whole world. Growing up without the security of a family, along with being citizens of the poorest country in the world, the youth of Emmaus House would seem to have all odds against them. Emmaus House, however, aims to restore their hope while providing them the life skills, professional skills, and education they need in order to afford them the opportunity to be productive, working citizens and faithful followers of Christ. Formed in August 2013, Emmaus House has strived to raise up next generation leaders for Haiti one young adult at a time. To provide life skills, professional skills, and education to young adults transitioning from an orphanage setting to prepare them to live independent and productive lives in Haiti. By the time a young adult transitions out of the Emmaus House and into Haitian society, it is anticipated that they will be able to function as an independent, educated young adult. They will have the skills needed to run a household, manage personal finances, work in a certain trade, or continue their education at the university level. To prepare youth to be followers of Christ and able to spread the gospel in Haiti. In addition, it is hoped that each young adult will be given the knowledge needed to become the next generation of leaders for the church in Haiti. Hunter and Jillian are the administrators for the Emmaus House. Although they are not living with the teenagers, their home is in the same community and is within walking distance from the home. Their responsibilities as administrators include raising awareness and support for the Emmaus House, Overseeing Emmaus Works, various trade programs, keeping supporters up-to-date via Facebook, blog, email, work as liaisons between the American and Haitian board of directors, assist Jonathan and Vivian, distribute finances, and be spiritual mentors to the youth in the Emmaus House. As you can see, they are essential in ensuring that Emmaus House is being run properly. One of Hunter and Jillian’s goals has always been to keep support at a minimum so that more funds could be allocated to Emmaus House. Hunter’s photography is a means to this end. A two week mission trip to Tegucigalpa, Honduras to serve, teach, and encourage the people of Honduras. The Honduras Mission also raises money to build a house for a family in Honduras. 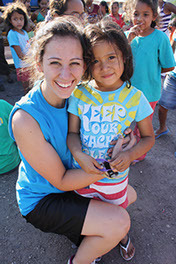 TORCH Missions coordinates and facilitates short-term mission opportunities to Honduras, Brazil, El Salvador, and the United States for youth, college students, and adults. The trips emphasize serving the impoverished and providing benevolent relief to those who suffer from the effects of poverty, disaster, and insufficient medical care. TORCH takes its mission from the words of Jesus in Matthew 25:40 "...Whatever you did for one of the least of these brothers of mine you did for me." In the preceding verses Jesus spoke of feeding, clothing, caring for the sick, providing shelter, and taking care of the needs of others. That is TORCH. For over 15 years, they have helped lead thousands of student and adult volunteers in providing relief in the form of the most basic necessities: food, clothing, shelter, and medical attention. In a typical year, TORCH will build close to 100 homes and repair countless others. They have built schools, churches, and feeding centers. They distribute well over 100,000 pounds of food, thousands of articles of clothing, and hundreds of pairs of shoes each year. They will spend hundreds of hours visiting hospitals and children’s homes, and conducting medical clinics that see up to 400 patients a day. Many TORCH teams will plan, organize, and conduct VBS events in the communities where they work that will share the stories of the Bible with literally thousands of children. The days are long, the work is exhausting, but the benefit to the communities and the volunteers is unmistakable. 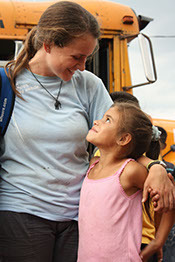 The experiences are life-altering for both the people of Honduras and those who come as a part of a TORCH team. Our group works closely with Mark and Lori Connell. Mark Connell has served on the Torch board since 1997. Mark has been actively involved with Torch Missions and is a charter member of the board. Mark has spent extensive time in Honduras including years in which he stayed in Honduras for the entire summer. He has led multiple groups to Honduras and has assisted other Torch teams as well. Mark has served as a youth minister since his graduation from Lipscomb and his wife, Lori, is one of the founders of Mi Esperanza, a women’s ministry that trains Honduran women how to own and operate their own business. Since 2008 Mark and Lori have been living full time in Tegucigalpa. Mark and Lori have two children, Ryan (28) and Eric (26) and two grandchildren with one more on the way. Jake and Jaclyn work with CUDA the Christian Urban Development Association which empowers vulnerable communities in urban Peru to overcome cycles of poverty. In addition to their work with CUDA Jake and Jaclyn are working to establish Christ's church in Arequipa. While spending time where people congregate Jake and Jaclyn share the gospel of Jesus Christ planting the seed and tilling the soil for the kingdom to take root organically. Jake and Jaclyn meet consistently with friends and neighbors worshipping in their houses. These groups experience fluctuating growth. Jake and Jaclyn love God and are happy to be in his service no matter the circumstances.